I wanted to add a new fireplace in my Den with a modern look? How can I do that without a chimney? Great question! 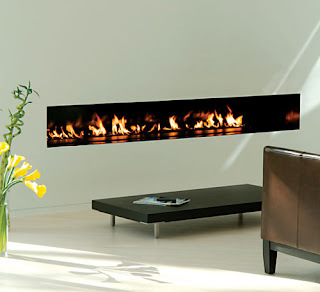 There are several Direct Vent modern gas fireplaces on the market with varying lengths (3ft, 4ft, 6 ft.) and you can install them with no need for a chimney or hearth! Since the air is drawn from the outside, there are no drafts and no heat loss. The fire is extremely efficient and effective. So, if you don't care about the smell of burning logs, this is the fireplace for you! Take a look at these websites: sparkfires.com and europeanhome.com. Both show a fire that is clean and to the metal edge of the fireplace unit. (as shown in the picture from sparkfires) Generally these fireplace units come with a fixed glass window and provide a great focal point for any contemporary space. I too wanted to install one of these gas fireplaces in our newly renovated Zen space (see Zen Modern post) but my husband prefers the smell and look of a cracking fire, so it didn't happen.... Oh well, I use candles instead!! I live in Orlando, Florida and the sie of my door frame has Dry Rot. What causes this and how do I fix it?